According to Statistics Finland, building costs rose by 0.3 per cent in August 2017 compared with the previous year's August. The prices of materials rose by 1.3 per cent and those of services by 0.6 per cent compared with August of the previous year. At the same time, the prices of labour inputs fell by 1.1 per cent. The fall in the prices of labour inputs is explained by lower employer’s social security costs compared with 2016. From July to August, the total index of building costs remained nearly unchanged. The prices of materials went up by 0.2 per cent and those of services remained on level with the previous month. The prices of labour inputs fell by 0.2 per cent which was caused by data revisions in the index of wage and salary earnings. ISSN=1799-5841. August 2017. 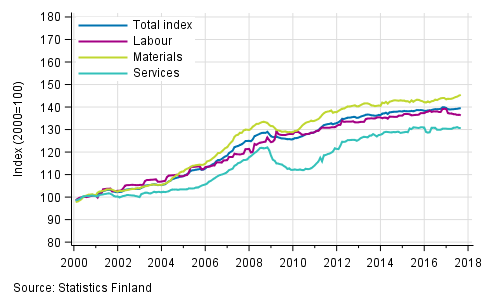 Helsinki: Statistics Finland [referred: 18.4.2019].